The cool weather and a book with cute projects inspired me last weekend and I decided to work with wool. 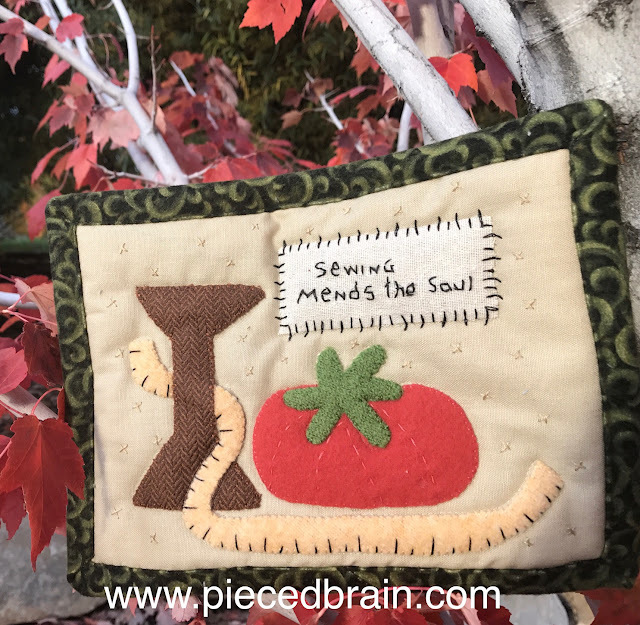 This mini quilt measures 7" x 9" and the recycled wool pieces came from three sweaters and a pair of pants. The simple embroidery was done with DMC floss. The osnaburg patch with the wording added a nice texture to the work. The background fabric is cotton and the embroidered Xs gave more depth to the project. I liked it so much that I had to make two identical pieces except this one was bound with flannel. 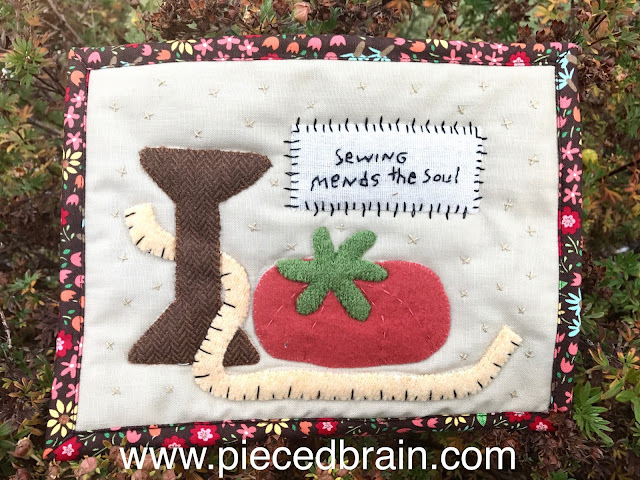 I used batting and a soft backing and quilted around the applique' shapes using Aurifil monofilament. These will be wall hangings as I will buy wire hangers and tiny clothespin to add in the gift bags (yep, two more Christmas gifts finished). The pattern is by Debbie Busby and can be found in her book Sew Many Notions - Wonderful Wool Applique's, Simple Stitcheries, and More published by Martingale. 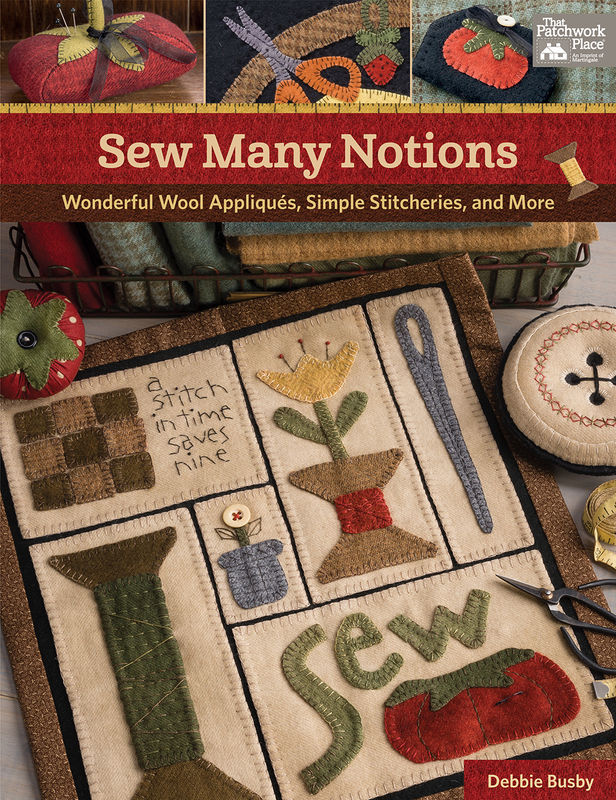 The projects in this book are fast to make because the shapes are large, the embroidery is easy, and the pieces are manageable so we can take them along and work on our gifts as we travel, watch the children or grandchildren play sports, or wait our turn at the doctor's office. The wall hanging above measures 24" x 32-1/2". 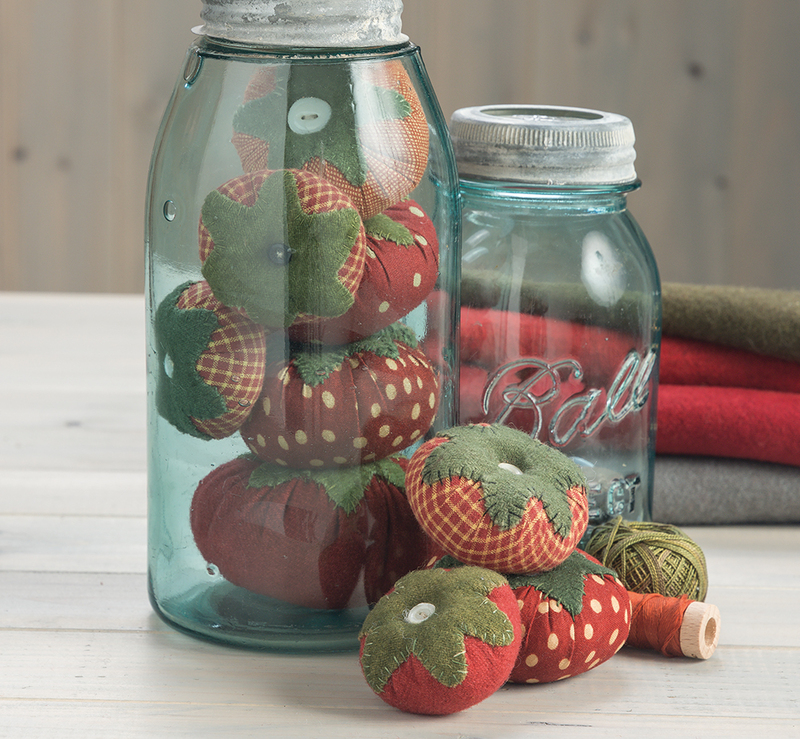 It is a perfect complement to a sewing room and an especially cute gift (that glove!). The center 'button' on this penny rug has beautiful embroidery and the buttons around it were stitched in different ways turning a simple design into an interesting composition. What cool pincushions! About those pins... they are fantastic! Finally, I confess I stared at this jar of tomato pincushions for a very long time. I love it! This will be a gift for me and I hope to get to it before the end of the year. I like books with pull out patterns and this one has them, as well as great information about how to prepare the wool, how to applique' it, and how to embroider those cute stitches Debbie used. I liked these mini wool quilts a lot. 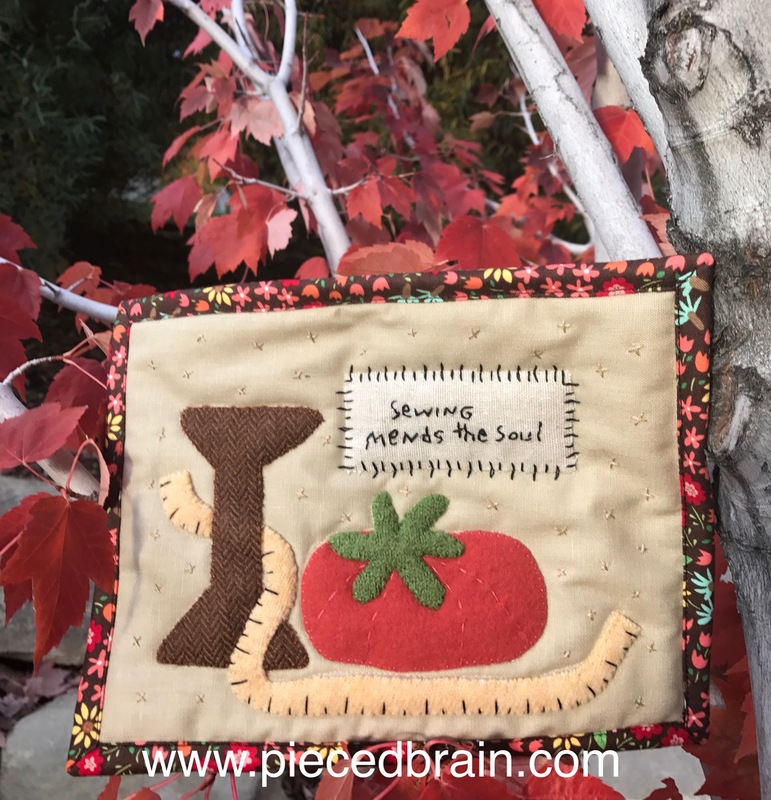 If you are looking for fun wool applique' ideas for Christmas gifts, check out Sew Many Notions - Wonderful Wool Applique's, Simple Stitcheries, and More. Handmade gifts are amazing: they are fun to make and fun to give to friends and family. It is akin to giving the same gift to two people: one person keeps it while it is being assembled, the other keeps it for life. Debbie's designs are magical as they bring back memories of those early sewists in our lives. 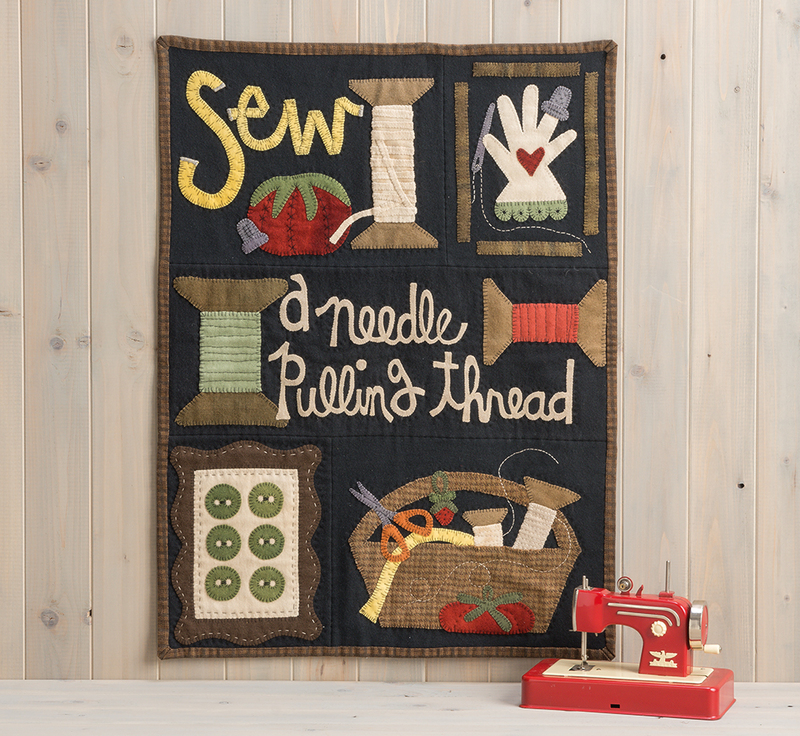 Her own training began by watching her great-aunt, her grandmother, and her mother sewing and culminated with the loving dedication of her home economics teacher, inspiring her to learn hand stitching. What inspires you? Wooden spools, pincushions, lots of buttons, and cool weather - that's all I needed to be inspired to create. Denise those are great! I love wool projects too. Got to love those giant spools with the big button pincushion! Oh, my goodness! Such cute projects!